Abstract -The design of Notch filter, in this case, requires the implementation of nested sub-circuits of Op-Amp and FLU-U2 universal filter. This project is completely based on modelling software Ng-Spice. The circuits are designed/drawn in NI Multisim software. and attenuate/reject all other frequencies. Few applications of Notch filter are in Raman spectroscopy, live sound reproduction systems and audio instrument amplifiers prevent audio feedback, laser or optical data links, Li-Fi, etc. Universal filter FLT-U2 is used to implement this Notch filter. FLT-U2 is an active universal filter. It uses state variable active filter principle to implement a second order transfer Function. There are three operational amplifiers that are used for the second order transfer function, namely High-pass filter output, Band-pass filter output and Low-pass filter output. The fourth uncommitted amplifier can be used as gain stage, buffer, summing amplifier or add another independent pole in the transfer function. By proper selection of external components, any filter like Low-pass, High-pass, Band-pass, Band-reject, Butterworth, Bessel, Chebyshev or Elliptic. This equation is used to calculate the value of resister R4 and R5 for the external components. This equation is specified in the data sheet for calculating the value of R3. The value of R2 is given as 100k. 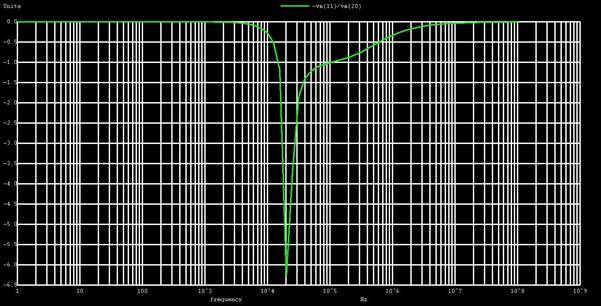 As no extra gain is required in the filter, the feedback and input resistances of uncommitted op-amp are used as summing amplifiers and must be of equal value. R8 = (R6||R7||R8) = 3.3k. R is the equivalent series resistance of internal and external circuit and C is the internal capacitance of the FLT-U2. As C is fixed, the frequency of Notch controlled by changing the value of R.
AC analysis was performed on this Notch circuit to obtain the desired frequency response according to the specifications. Results of ac analysis of Notch filter. A notch was obtained at 20kHz as observed on the output frequency response. Thus the notch filter design was modelled using NG-spice software.